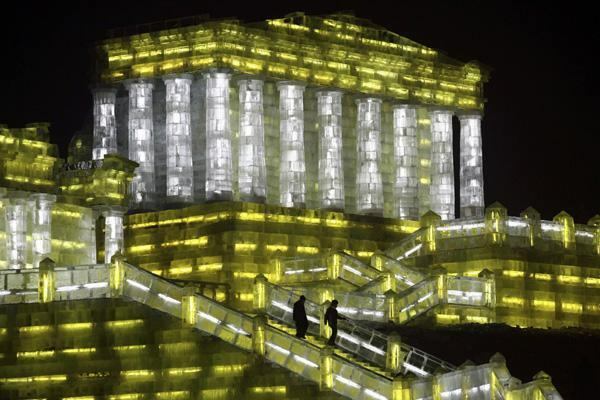 In many locations during the Winter across the world, art still lives in ice sculpturing. I have been to several ice sculpture exhibits in the Midwest and they are wonderful. The only negative, of course, is that the sculpture is temporary and will only last as long as the weather is below freezing. 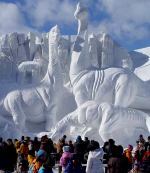 One major ice/snow festival is the Sapporo Snow Festival (See picture at right below. Click on the images for full size). The 60th festival will be held next month. It is held in Sapporo, Japan. Surprisingly the festival began in 1950 when six high school students built snow statues in Odori Park. When the Japanese armed forces joined in to create sculptures, the festival became famous. 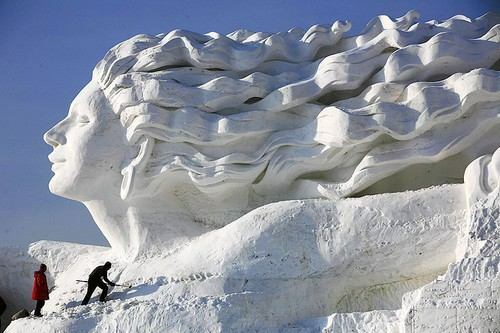 The largest snow sculpture in the world was said to be shown at the annual Harbin International Snow Sculpture Festival in Harbin, China. It was 35 meters tall and 162 meters long (See right). It was placed in the expo's square. This festival is the largest and perhaps the most magnificent festival in the world. They have held the festival since 1963. They don't worry too much about the weather because the wind is frequently from the direction of Siberia. The average Winter temperature is -36° F (-38.1° C) The 24th festival is this month in Harbin in north China. At night they light many of the sculptures. Some of the sculptures are lit at night (see below). There are also those who do ice sculptures professionally. Janson Iwakami does ice sculptures for weddings, ice bars, parties, centerpieces and more. Janson creates his own ice so the ice is crystal clear. He says it takes 3-4 days to make a block of clear ice. Small sculptures take two hours with an additional 5-7 hours for ice creation and transportation. An ice sculpture will last about 6-7 hours indoors. 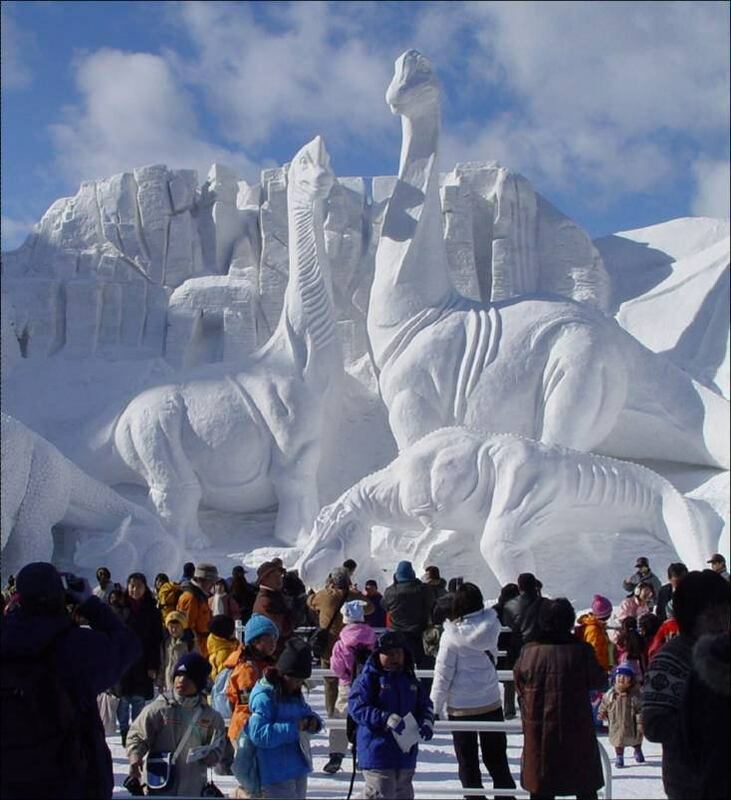 If you do a search on the internet, you will find many other ice sculptors. They all use common tools. Some are chain saws for cutting and shaping, a grinder for adding details, and a heat gun for glossing, rounding or repairing. An ice sculptor should wear ear and eye protection, and kneepads. The sculptor accused of "not leaving well enough alone" in the video above is Junichi Nakamura at the World Ice Art Championships in Fairbanks, Alaska. Almost every year, he pushes the limits of ice sculpting with his daring sculptures. He knows that there is a strong possibility that the sculpture will collapse when he cuts the final support struts. This year, he and his team carved a wildebeest being attacked by a lion. The wildebeest had very little support and was possible only because it was largely hollow. In fact, the sculpture later collapsed when a worker was using a leaf blower to knock snow off of it. I was at the event this year (you can see what I did at www.icealaska.com/) and I've been on Junichi's team in the past. I'd also like to add another link about ice sculptures: www.icecarvingsecrets.com. Thank you for posting info and pix about the art that we love! 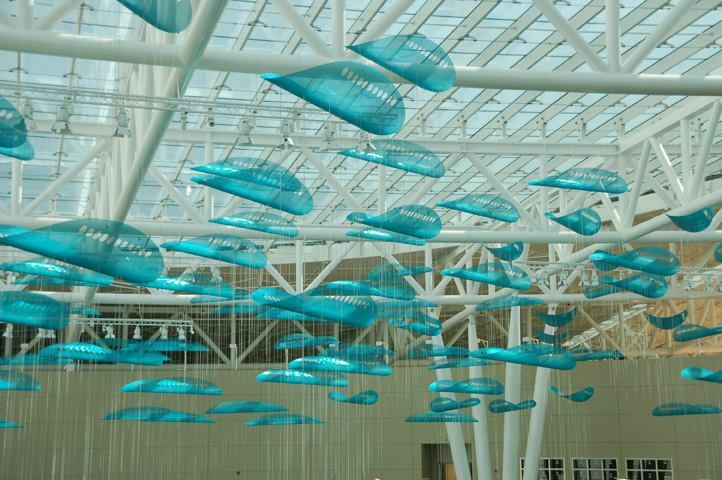 Indianapolis opened its new state-of-the-art airport in November and adorning the new airport is four million dollars of art from sixteen different artists across the USA. Terminal excavation began in 2005. (See details of the construction and design) This is the first airport in the nation to be built post 9-11 and includes designs that promotes security and makes it easier to go through the security check. Artist Ron Baron from Brooklyn, N.Y.- His airport art is called "Baggage Claim." 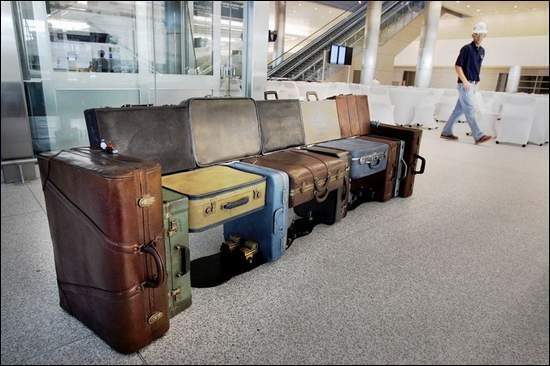 These are bronzed suitcases and serve as functional seating in the terminal's baggage claim area. He has created other bronze sculptures primarily in New York. He has done similar things at other transportation locations. He also has sculpture along the Long Island Railroad. You can read more about Ron on his website. Artist Rob Fisher from Bellefonte, PA - His contribution is called "JetStream." His sculptures adorn the ceiling of the Civic Plaza Atrium. The metal sculptures suggests birds or clouds. Rob studied design from a Fulbright Fellowship in Scandinavia and Rome. He has another sculpture located at the Philadelphia International Airport. That work is called "American Dream." Says Rob Fisher of Philadelphia sculpture, "Art serves as a marker of a society’s values. During troubled times art, in whatever form – poetry, dance, painting, sculpture, music - becomes even more precious. Art possesses healing powers. It is a creative, positive action. It transcends borders, boundaries, divisions, divisiveness, politics and war. Art is timeless and enduring in contrast with media-driven moment-by-moment unfolding of events." Unfortunately Rob passed away in 2006 and his family completed this sculpture. Rob's daughter, Talley Fisher, continues creating sculptures. Before he died, he formed his own company along with his family, RFS LLC. One of his more notable sculptures includes one that incorporates the Declaration of Independence. You can see more of his sculptures and read details about his biography on his website. Artists Cameron McNall and Damon Seeley, from Los Angeles- Their work is entitled, "Interactive Passage." 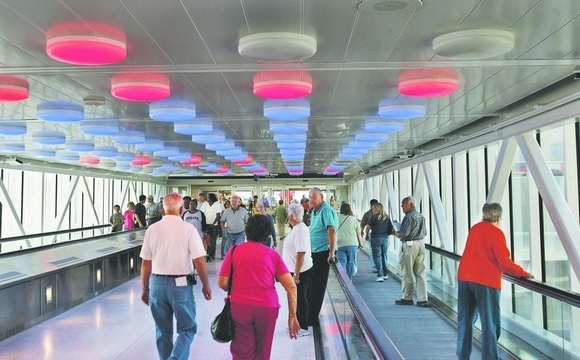 Interactive circular colored lights dot the ceiling along the pedestrian bridge connecting the terminal and parking garage. The lights also emit sounds and flash different colors. McNall and Seeley are both partners of Electroland. This team creates objects, interactive experiences and large-scale public art projects. Seeley holds a design degree from UCLA and helped create the Emergence Virtual World project there and has traveled extensively to Spain, Austria, and Italy. His work is on display at the Museum of Contemporary Art (MOCA) in Los Angeles. He has also dabbled in film-making in creating visual effects. McNall is an architect and educator. His work varies from multimedia to public art. He taught for UCLA in the Department of Design and Media Arts for twelve years before devoting himself to his art full time. He holds a Master of Architecture from Harvard. His exhibits include those in Rome, New York, and Los Angeles. McNall also has dabbled with film-making and his work has been shown in more than thirteen countries. Artist Martin Donlin from East Sussex, England- Donlin created 500 square meters of antique stained glass in 14 windows. 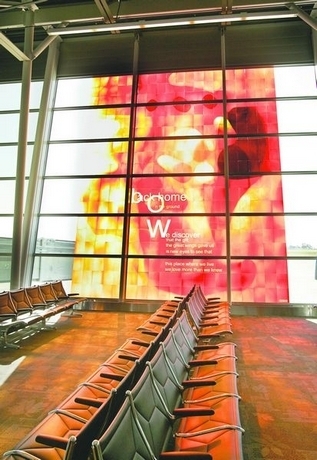 The windows in Concourses A and B are designed in collaboration with various Indiana poets. The poets worked via the Internet and produced work of "far off places" and "dreams of homecoming." The panels have the title of each poem in large letters along with the text of the poem within the art. Donlin received his training in Swansea and has exhibited work in Belfast, Frankfurt, Munich, and other countries. His latest work is commissioned from Crown Estate and adorns Heddon Street in London. It is housed in an old Victorian art gallery. Patrons can enjoy his art while waiting for an elevator. You can see more on his art and biography on his website. Other artists represented include Lynn Basa, Arlon Bayliss, Dale Enochs, James Wille Faust, Ann Gardner, Dixie Friend Gay, Greg Hull, Stuart Keeler, Michael Machnic, Brian McCutcheon, Tom Torluemke, Nhat Tran, and John Van Alstine. UPDATE (July 5, 2013] - This contest has finished and is no longer being held. You can see the winner on their website. To create a logo for the Coalition of Organizations for Accessible Technology (COAT). The logo will be used to represent COAT and its mission to the general public, and may be used for COAT’s printed materials, website, apparel, and other uses for which COAT deems appropriate. COAT is a coalition of 220 national, regional, state, and community-based organizations advocating for full access by people with disabilities to evolving high speed broadband, wireless and other Internet protocol (IP) technologies. The Coalition is dedicated to making sure that as our nation migrates from legacy public switched-based telecommunications to more versatile and innovative IP-based and other communication technologies, laws are in place to ensure that people with disabilities are also able to enjoy these innovations. In particular, COAT’s efforts are focused on securing access to telephone type products used with advanced digital and Internet-based technologies, and to video programming on television and on the Internet. Download, complete, and sign the COAT Logo Contest entry form. To be eligible to participate in this contest, entrants must be residents of the U.S. who are 18 years of age or older. People who have a disability or who have experience with disability issues are especially welcome to participate. Logos should reflect the purpose of COAT to ensure accessibility by people with disabilities to advanced communications and video programming on the Internet. All entries become the property of COAT upon their submission. Contestants must agree to COAT's use of each entry in materials supporting this contest, including posting on the COAT website, and use of the entry in media releases and other public documents and events. A completed and signed logo contest entry form is required for each logo design. Logo designs must be camera ready art, not larger than 8 ½" by 11" in size. The logo contest ends on Tuesday, January 20, 2009. All entries must be received by COAT at one of the above addresses by midnight, January 20, 2009, to be considered. The contest winner will be announced as soon as possible thereafter. The designer of the winning logo will receive five hundred dollars ($500). This will be the sole compensation for the winning logo. After the contest, COAT has the right to use the logo for any purpose related to COAT activities, including but not limited to, stationery, websites, business cards, media releases, public events, clothing or other apparel, without financial or other remuneration or attribution to the winner. The winner must acknowledge that COAT has the right to publicize the winner’s name, likeness or photograph, and the fact that such individual is the logo contest winner for promotional purposes without financial remuneration. If a winner cannot be notified within seven (7) days of selection, the COAT Steering Committee may select an alternate winning logo and award the prize to the alternate logo contest winner. COAT will deliver the prize in the form of a check, by first class mail, to the winner within thirty (30) days after notification.